Universal Fully Adjustable Faux Leather Shoulder Harness Sheath For Sword Or Katana - Scabbard Adjusts From 1" To 2 1/2" - 22 1/4" Overall | BUDK.com - Knives & Swords At The Lowest Prices! 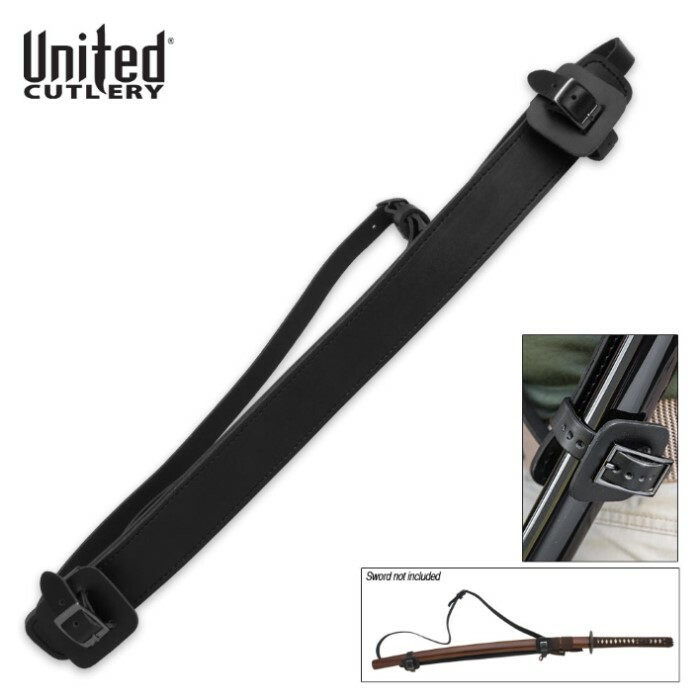 Sword straps adjust from 1" to 2 1/2"
This fully adjustable imitation leather harness is designed to fit virtually any size sword whether it's tactical, traditional, European or a wakizashi. 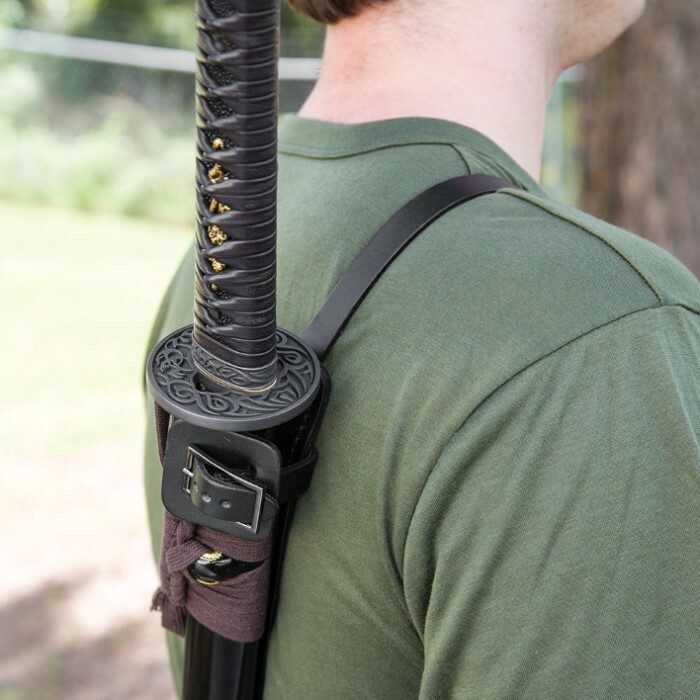 The durable shoulder strap adjusts to where you need it so that your sword fits comfortably across your back. The straps to secure your sword can be adjusted from 1" up to 2 1/2" and the harness is 22 1/4" overall. You absolutely need this sheath to carry your sword around because it's more secure than carrying your sword on a belt. Go ahead and pick one up today. I bought this to go with my Halloween costume for a sword I bought which happen to be the anime fantasy sword with scabbard. I'm able to wear it but I can not draw my sword at all which is disappointing. I think it is made only for samurai swords. Very comfortable and it looks and feels amazing. I like the feel of the Imitation leather and it also came in pretty quickly too. I definitely would recommend to others on getting it. Only issue I had was that its hard to draw from your back while strapped on. Maybe not right for Katana sized sword but I bet it will work well with the wakizashi. The materials are all good, but it needs to be a lot tighter. I have it set to be as tight as possible but it needs more. I can draw both of my katanas from it just fine, but getting them back in is not possible. I ordered my shoulder harness on Monday and it got here on Saturday at noon I got it to put on my black shinwa ninjato which I also got from BUDK the shoulder harness looks good its black to match my sword and even though it's imitation leather it smells like new leather! It has the united cutlery logo on it and looks really good. The only bad thing about it is im 5ft 8in tall with 29' waist its a lil big for me and hangs loose I'm gonna have to punch some extra holes to tighten it up to fit me perfect but that's not really a problem so all N all I'm happy and I get to start shopping for the next product I'm gonna get from BUDK !!! I recommend this shoulder harness ! Excellent product and very fast delivery. The "imitation leather" is like a very thick rubber and appears to be very durable. 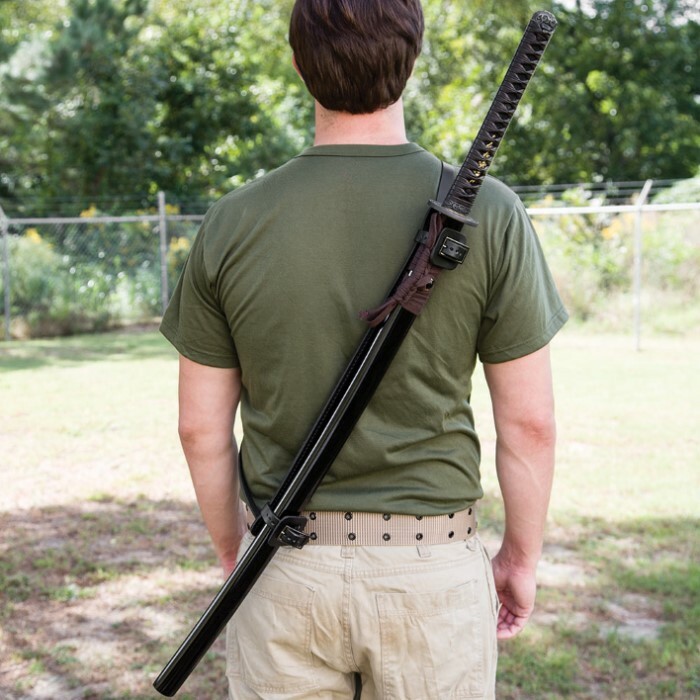 Although a katana would be virtually impossible to draw from the back, my wakizashi fits, wears, and draws perfectly! Well made leather strap system. I applied one on the musashi 1060 carbon steel sword scabbard and the Ultraviolet sword scabbard and they fit perfect. The straps I pulled as tight as I could and there is no slippage at all. I ran with them on my back and jumped up and down a few times. Highly recommend these. They will even fit on some shotguns and rifles. Well done again True Swords. This shoulder harness works not only with asian swords, but european swords as well. I can have it on all day in comfort. I highly recommend this product. I have had the system for nearly a year, so Iâ€™ve had adequate time to evaluate it. I believe the shoulder would be more comfortable if wider and should be of better material as the shoulder strap cracked. Fortunately there are many leather craftsmen in my country and had a new one made of leather. I was looking for something to carry a katana hands free and out of the way and this system works well. While finding no true faults with this carry device other than the strap material I have to take exception to those who posted in their review that the sword cannot be drawn with the Back Strap in place. It is also possible to remove the carrying device from the back and draw, but that is cumbersome and unnecessary. I have said before that the draw can be done from the back and people continue to post otherwise. Below is a short video I made and should convince the inept it is possible, and should carry more weight than my written statement. I've had my back strap for a few years now. The quality of the system is actually rather nice - I've had no problems with any stitching, no problems with the buckles and such. The leather has held up nice, despite a minimum of attention. However, the one problem I have with it is that it's proven entirely impractical. The sword does not rest low enough, perhaps? The result is that the sword cannot be drawn while wearing this as the picture shows. That being said, it is still rather useful if you don't mind carrying the blade over your shoulder, as you would a rifle.